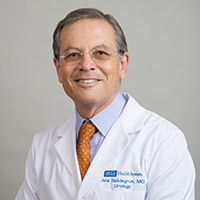 As the Director of the UCLA Institute of Urologic Oncology (IUO), I am excited to lead a multidisciplinary team of scientists and physicians, from disciplines including urologic oncology, medical oncology, diagnostic and interventional radiology, pathology, nursing, basic sciences and clinical trials, to work together as a team to personalize patient care and to develop state-of-the-art technologies and revolutionary treatments for prostate, kidney, testicular and bladder cancers. The UCLA Medical Center consistently ranks number one on the West Coast and in the top five in the nation for cancer care, according to U.S. News and World Report. The exceptional group of physicians, scientists and staff of the UCLA Medical Center and the UCLA Institute of Urologic Oncology have achieved this prestigious honor by focusing our efforts on finding cures for urologic cancers through research and to provide patient-centered care with unparalleled dedication, providing personalized treatment with compassion. The UCLA Institute of Urologic Oncology (IUO) was established to offer urologic-cancer patients comprehensive care and early access to the most advanced treatments available. I truly believe the IUO is poised to become the global leader in targeted areas of urologic-oncology investigations for prostate, kidney, bladder and testicular cancers. At the IUO we foster a “no-boundaries” philosophy with which our researchers and clinicians approach their work, by bringing a world-renowned team of experts together under one roof that results in team-based, disease-focused treatment regimens and will set a new standard of urologic-cancer care. Patients seen at the IUO will have access to all the clinical resources they need in one place, eliminating multiple visits and disjointed decision-making. The IUO will create truly personalized, patient-centered care – the first of its kind in urologic oncology. As one of the largest and most diverse research programs of its kind in the United States, the UCLA Institute of Urologic Oncology is working to advance the understanding of prostate, kidney, bladder and testicular cancers. Bringing specialists from different disciplines together will revolutionize the study and treatment of these diseases. Our scientists and physicians within the IUO rigorously pursue current projects, develop new ideas to redefine treatment options, launch innovative clinical trials, enhance training and education to prepare future leaders in the field, and, most important, bring laboratory findings directly to patients more effectively, efficiently, safely, and rapidly. Simply, all of us within the UCLA Institute of Urologic Oncology aim to offer our patients outstanding, individualized surgical and medical care and access to innovative clinical trials with the overall goal to cure urologic cancers. This is our mission. We welcome you to the UCLA Institute of Urologic Oncology!